Every day we get interesting genealogy questions from our members via our Ask the Genealogist service. The following is a good example: a member asked for help finding information about a great-grandfather. I am looking for more information on my great-grandfather, Edgar Rhue Harner. He was born in Berks Co., PA, in 1860. He married Naomi Sines and they lived in Delaware Co., PA. No one in the family knows what happened to Edgar. I tracked census info and the last one he appears in with his family is the 1910 census, enumerated in Delaware Co, PA. After much research, I found him in the 1920 census in Norristown, PA, as a patient in the “State Hospital for the Insane.” That hospital, Norristown State Hospital, is still in existence, but I haven’t been able to get any info from them. Everything dead-ends at the 1920 census. I can find NO obituary or death record or any other info at all. You need to click on each year and then search the index. This indexing system uses the Soundex system familiar to many genealogists; it assigns codes to sounds to track down surnames and their variants. Harner would code out to H-656. And there he is listed in the deaths for 1922. H-656: Edgar Harner, Certificate Number 106302, Norristn (abbreviation for Norristown), died 11/17 (17 November 1922). 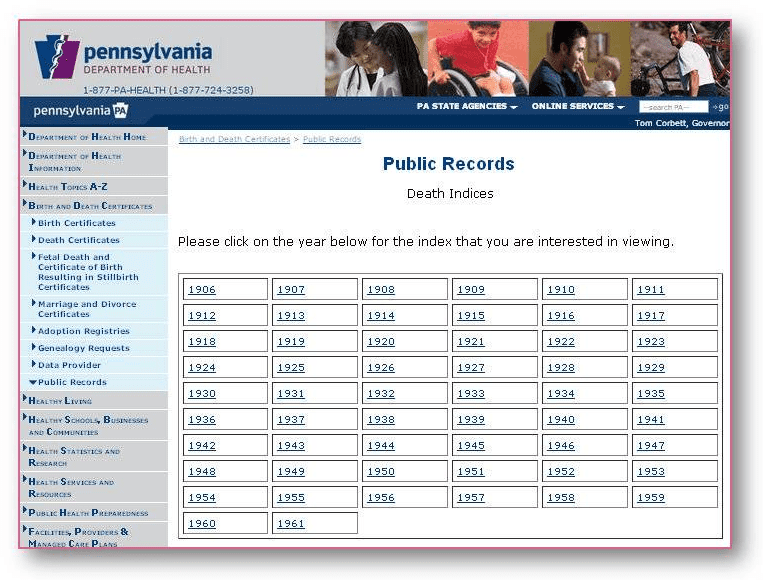 Pennsylvania considers death certificates that are over 50 years old public records. So, your next step is to order a copy of his death certificate. There is a $3 fee for each non-certified copy ordered. 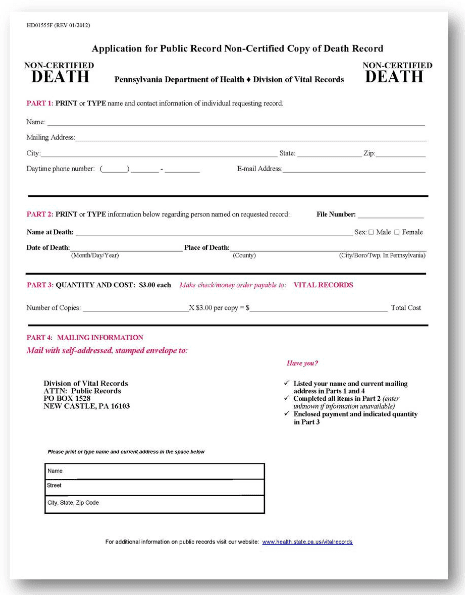 Check or money order should be made payable to Vital Records. Mail requests are processed in approximately 4 months. "D" do you think this means death? "250" I have no idea what this might mean. "51" No idea what this means. "5" – probably the month of death. "7" probably the day of death. "31" probab ly the year of death. "46534" probably the death cert #. It would be nice to know what the other numbers mean. It looks like different years have different types of indexes. The earlier years seem to list the deceased in alphabetical order by last name. The later years look like they're ordered by Soundex. Your D250 may be the Soundex code. The 51 could be the Ward. The rest, as you guess, looks like the date of death and cert #. 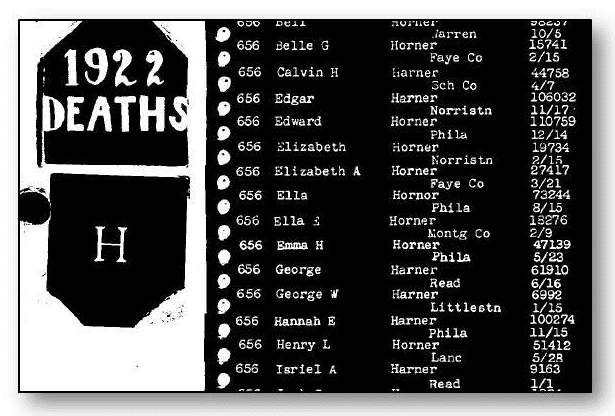 The way I tried to figure it out was looking up someone in the index that I already had a death certificate for. If I would appear in person at a PA vital records office (New Castle) with applications for n on-certified c.f. copies, would they be able to give me the records then and there? Office hours 8:00 a.m. to 4:00 p.m. Monday through Friday, excluding State holidays. For walk-in services, please allow 3 hours processing time for standard requests. Persons requesting same day processing should be at the office no later than 1:30 p.m.
You will be required to complete an application for certified copy of a birth or death certificate. You may download Adobe Acrobat Reader to print the application. You must present valid government issued photo identification. Examples of acceptable identification are a state issued driver’s license or non-driver photo ID with requestor’s name and current address, etc. If you do not have acceptable photo identification, please follow this simple set of instructions in order to obtain a birth certificate. There is a $20 fee for each certified copy of birth and $9.00 for each certified copy of death. Check or money order should be made payable to Vital Records. No fee may be required for certificates of Armed Forces members and their dependents.